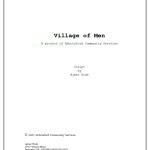 Village of Men was initiated and funded by the Abbotsford Community Services Society (British Columbia, Canada) and produced by upNext Media a professional movie company based in metro Vancouver. The play portrays domestic violence involving a young couple Paul and Rani. The scripts were written, both in English and Punjabi, by Ajmer Rode. The 12 short scenes were then developed as television PSAs (public service announcements each 30 seconds long). The scenes, all directed by Ajmer Rode, posed quite a challenge because of the time constraints. 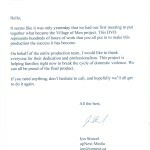 A DVD of the play was also produced.